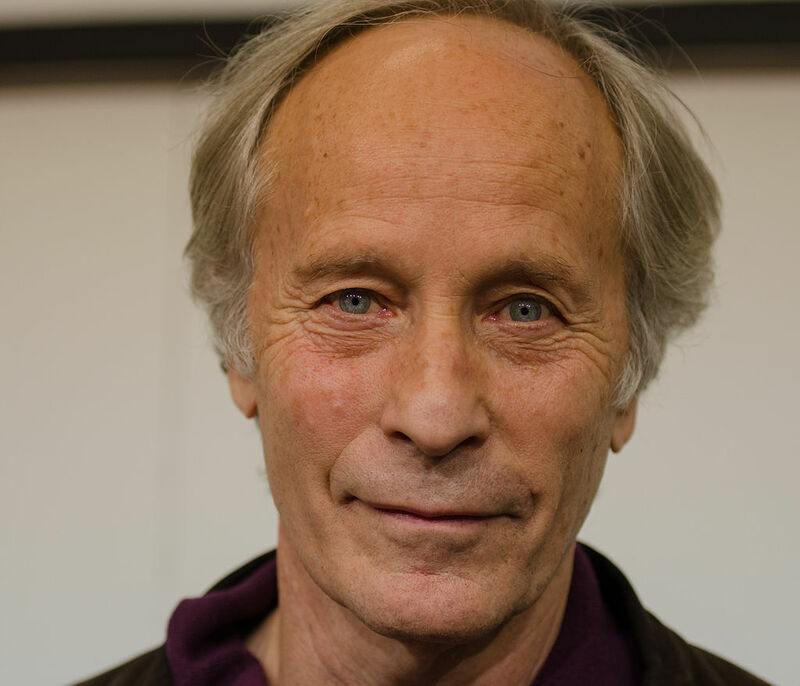 Richard Ford is one of my favourite writers. I loved the three previous Frank Bascombe novels: The Sportswriter (1986 ), Independence Day (1995) and The Lay of the Land (2006). It was generally felt that Ford had done with this character, but he has now brought him back from retirement in another terrific novel. It isn’t quite up to the standard of the best – the middle one of the trilogy – or the other two, but it’s still damn good. In four loosely connected novellas Frank, now 68 and that paltry thing, an aged man — not quite Yeats’s ‘tattered coat upon a stick’, but still fearful of falling and breaking his hip as a consequence of the giddy spells he suffers. These are caused by a problem in his neck bones, as he frequently tells us with the clinical relish of a chronic sufferer. He worries about his declining physical state a lot: Alzheimer’s, heart disease; he notes the deterioration in his contemporaries – ex-wife Ann has moved to an expensive NJ care facility, suffering from Parkinson’s, near enough for him to feel obliged to visit regularly (one such visit is the subject of section 3). Frank is full of intimations of mortality now. He calls himself a ‘prostate “survivor’. Things are falling apart. He’s fond of quoting from a range of writers – Yeats, Richard Hugo, Roethke, and especially Emerson: ‘an infinite remoteness underlies us all’. 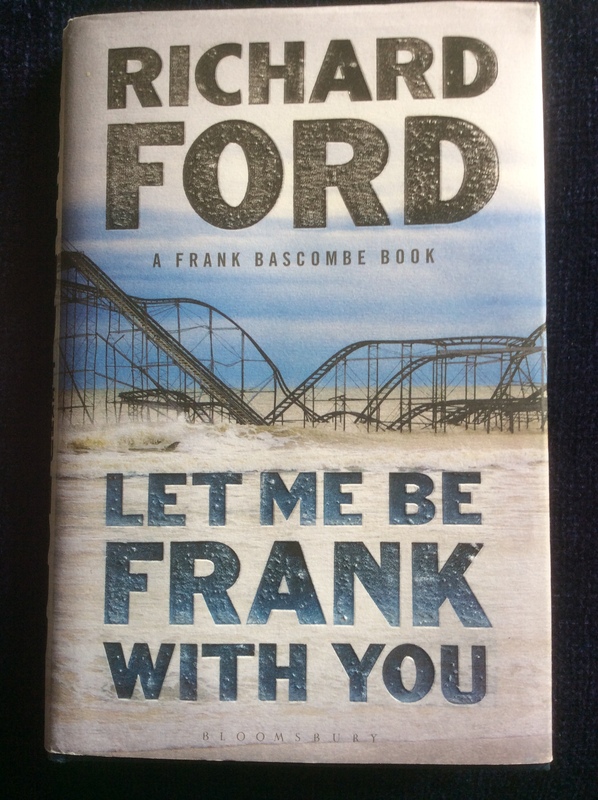 There are plenty of reviews out there which will provide more plot detail, so I’ll concentrate here on the distinctive Ford style, thereby I hope indicating what it is that makes this worth reading (it took me just three sittings: the font is quite large and the lines are wide-spaced). Strange fragrances ride the fragrant, twitchy wintry air at the Shore this morning…Flowery wreaths on an ominous sea stir expectancy in the unwary. It is, of course, the bouquet of large-scale home repair and re-hab. Fresh-cut lumber, clean, white PVC, the lye-sniff of Sakrete, stinging sealants, sweet tar paper, and denatured spirits. The starchy zest of Tyvek mingled with the ocean’s sulphurous weft and Barnegat Bay’s landward stink. Much of this reads like prose poetry: there are beautiful sound patterns, symmetries (the alliteration and near-rhymes like ‘strange fragrances’); the deftly chosen adjectives (‘twitchy wintry air’) surprise and delight (it had to be ‘wintry’, not ‘winter’; not sure why). He’s good on weather effects: he talks elsewhere of NJ’s ‘discordant skies’. There’s a pleasing mix of registers, from the lyrical, literary ‘Flowery wreaths on an ominous sea’ to the American-demotic/informal list of DIY materials in the second paragraph. The loping first-person present-tense narrative voice takes us right into Frank’s head as he contemplates impermanence, transgressions and loss, ‘the bruise of defeat’. It usually has that mesmerising blend of relaxed vernacular and pungent philosophising. And the style has become sparer, more stripped-down, compared with the earlier trilogy; Frank has begun an ‘inventory’ of ‘polluted words’ that should ‘no longer be usable – in speech or any form’. Among his pet hates are the clichés ‘no worries’ and a well-wisher being ‘here for me’. …life’s a matter of gradual subtraction, aimed at a solider, more-nearly-perfect essence, after which all mentation goes and we head off to our own virtual Chillicothes…When you grow old, as I am, you pretty much live in the accumulations of life anyway. This English reader often finds these American references obscure: I’d welcome an explanation of that Chilicothe allusion; all I know is it’s a town in Ohio? The world gets smaller and more focused the longer we stay on it. views life as one thing leading naturally, intriguingly on to another, whereas I look at life in terms of failures survived, leaving the horizon gratifyingly – but briefly – clear of obstructions. Love isn’t a thing, after all, but an endless series of single acts. I sincerely hope this is not the last we hear from this battered but indomitable New Jersey survivor. 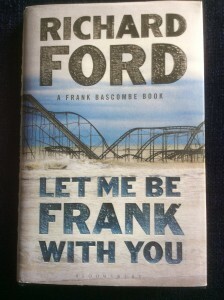 Richard Ford, Let Me Be Frank With You: A Frank Bascombe Book. In Our Time is the first collection of short stories written by Ernest Hemingway, published by Boni & Liveright in New York in 1925. A[n] earlier edition titled in our time (without capitals), had been published a year earlier in Paris, in 1924. The Parisian edition consisted of only 32 pages, printed in a small print-run of 170 copies, [and] contained vignettes that Hemingway would use as interchapters for the expanded 1925 New York edition of In Our Time. He rewrote two of the earlier vignettes, “A Very Short Story” and “The Revolutionist‘, into short stories for the New York collection. Bill Bird’s Parisian high-end printing company, Three Mountains Press, founded in the early 1920s, employed Pound as editor who sought to “keep the series strictly modern”.Their aim was to publish well-produced limited private editions by a handful of modern authors, including Pound himself, and Joyce, in small print-runs. Hemingway, who was unpublished, gave Bird the manuscript of vignettes that Hemingway titled Blank, which he later titled in our time from the Book of Common Prayer. When American editors queried him about the lower-case title, Hemingway said it was “silly and affected”. My thanks to John for pointing out this inaccuracy. I shall amend the original post and remove the error. The donnée for ‘Daisy Miller’ was an anecdote told to Henry James (1843-1916) by his friend Alice Bartlett in Italy a year or so before its first publication in 1878. James transformed this wisp of narrative into a vividly realised comedy of social manners which ends with a delicately sketched scene of pathos and loss. He subtly evoked the tourist haunts of Vevey in Switzerland, where the story opens one June, and Rome, where it ends the following January, having spent several years of his life in these places that were so fashionable with the new waves of moneyed Americans dutifully following their Baedeker guides to the tourist honeypots of old Europe. James knew that recently-appeared type: the ‘American girl’ from Schenectady (home of the newly self-made rich, not of those with ‘old money’) disembarking from her transatlantic liner full of brash confidence, in the ‘tournure of a princess’. With their air of regal independence such ‘stylish young girls’ are ‘not the least embarrassed’ to find themselves unchaperoned in the company of strange young men. When Daisy encounters the story’s protagonist, the wealthy Frederick Winterbourne, a twenty-seven year old dilettante, on the terrace of the Trois Couronnes hotel, noted for its air of ‘luxury and of maturity’, on the shores of Lake Geneva, ‘she was evidently neither offended nor fluttered’ to be engaged with in familiar conversation by this suave stranger to whom she had not been formally introduced, and without the protection of her unvigilant mother. He is thinking approvingly of the ‘type’ just noted. Her name is Annie P. Miller – a pointedly artisanal surname – but is known as Daisy. If Winterbourne’s name is redolent of his frigidly Europeanised nature (though he is not averse to clandestine affairs), then hers signifies her spring-like, blooming freshness. In buttoned-up Geneva, he reflects, ‘a young man was not at liberty to speak to a young unmarried lady except under certain rarely-occurring conditions’. But here at Vevey the ‘pretty American girl’ shows no signs of constraint. On the contrary, her glance towards him is ‘direct and unshrinking’, though ‘not immodest’ – her eyes, he notes admiringly, are ‘singularly honest and fresh’, and ‘wonderfully pretty’; the word ‘pretty’ is used a remarkable 38 times in the story, most of them with reference to Daisy or her ‘type’ (she is described as ‘beautiful’ three times). Winterbourne is ‘addicted to observing and analysing’ feminine beauty: that is to be his problem. Like so many of James’s detached, observing male protagonists, he is incapable of committed action or decision-making. He is from the start enchanted but also puzzled by the liberties taken by this young charmer. Like Eveline in the Dubliners story which I wrote about here recently, it’s indecision and inability to discriminate morally and emotionally that’s at the heart of this story. Her equally precocious little brother Randolph tells him their father is a rich businessman from Schenectady. She ‘chattered’ expansively and unselfconsciously. He ‘found it very pleasant’, but our taciturn narrator conveys a simultaneous sense that she is hardly articulate and certainly uneducated, with her frequent low idioms (as the fastidious Jamesian narrator would say) such as ‘I guess’ and ‘ever so many’. The narrative voice is then distinctively Jamesian: detached and ironic, it notes at this point Winterbourne’s mixed reaction to all this superficial flirtatiousness: he ‘was amused, perplexed, and decidedly charmed,’ but had never seen anything like this without sensing ‘laxity of deportment’. He goes on to wonder whether he had spent so long in Europe he had become ‘dishabituated to the American tone’: maybe it would be wrong to accuse Daisy of what passed in Geneva as ‘actual or potential inconduite’. In a revealing passage of narrated thought he weighs up the possibility that ‘they were all like that’, the pretty girls of New York: or ‘was she also a designing, an audacious, an unscrupulous young person?’ His ‘instinct’, along with his ‘reason’, had deserted him (as Eveline’s were to). She ‘looked extremely innocent’, and he’d heard both that ‘American girls were exceedingly innocent’, and that they were not. ‘Innocent’ appears twelve times in the story, nine times in relation to Daisy (twice, interestingly, to Winterbourne himself; he is perhaps the truly innocent party in this tale, in the sense that he doesn’t fully know himself as Daisy does herself); ‘innocence’ appears in relation to Daisy six times. He was inclined to think that she was just ‘a pretty American flirt,’an ‘unsophisticated’ girl: ‘she was only a pretty American flirt.’ His repetitive, looping, inconclusive internal monologue over, he wonders (ungallantly) how far he can proceed with this new, ingenous kind of coquette. She’s not just being snobbishly malicious: he’s revealing himself, she means, with shrewd insight, as hypocritical: attracted to Daisy, while aware of her genuinely vulnerable, bourgeois innocence. The stage is set. If Daisy exceeded even the ‘liberal licence’ of his aunt’s granddaughters then ‘anything might be expected of her’. Unaware of the unflattering sexual ambiguity of such a notion, he realises he is impatient to see her again, and yet, more to his credit, ‘vexed with himself that, by instinct, he should not appreciate her justly.’ This is the lesson he is to learn by the end. I have given this detailed outline of the story’s early expositional stage to indicate that it is really as much a narrative of Winterbourne’s slow-growing awareness as of Daisy’s, who hardly changes. A typically ambivalent James protagonist, he feels attracted to this beautiful figure with her ‘delicate grace’, but simultaneously repelled by what he perceives as her ‘commonness’, vulgarity and duplicity. This renders him emotionally, culpably impotent. She’s the ‘unprotected daughter’ of a wilfully indulgent mother and absentee father, and this makes him painfully aware of being tempted by what could be perceived as cynically selfish exploitation of her ‘habitual sense of freedom’. She simply doesn’t realise that ‘nice girls’ don’t flirt with their couriers, imperiously demand unquestioning devotion and attention from every new man they meet with ‘frank persiflage’ and coquettish chaffing, or flaunt their innocent conquests in public. 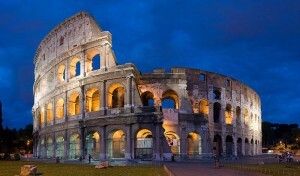 The denouement shows Daisy’s subsequent, inevitable disgrace in Rome. Winterbourne’s glacially sophisticated American friend there, Mrs Walker, tells him with horrified disapproval that Daisy had been ‘going about’ alone with foreigners and had ‘picked up half-a-dozen of the regular Roman fortune-hunters’. She and her mother were ‘dreadful people’ for behaving with such ill-mannered licence (Mrs Miller is equally reprehensible for failing to control her daughter, in the eyes of this morally corrupt world where being seen to do the ‘right thing’ is more important than actually behaving with moral probity). Winterbourne feebly defends them, calling them ‘very ignorant – very innocent only’, but Mrs Walker is unforgiving in her condemnation: ‘They are hopelessly vulgar’, she insists. When Daisy insists on introducing her ‘lovely’ avvocato with the charming manner and beautiful moustache to her compatriots’ salons she refuses to accept that she is violating not only European codes, but also those of upper-class Americans who lived there. She delights in having handsome Romans dance attendance on her; Giovanelli (whose name signifies the generic young man he represents) for his part can’t believe his luck, failing initially to understand her flirtatious nature. Mrs Walker duly snubs the girl when she turns up later at her salon, writing her off as ‘naturally indelicate’. Daisy is undaunted, and continues to disport herself as she pleases with the foppish young gold-digger. In a scene that echoes his interview with the disapproving aunt, he defends Daisy as just ‘very innocent’ when Mrs Walker expresses how appalled she is that Daisy has been recklessly exposing herself to all the world with her beau and ‘running absolutely wild’. ‘She’s very crazy!’ is her riposte. She warns him to cease flirting with Daisy, and to stop her making a ‘scandal’, but he persists, confused and besotted. He sees this as lacking ‘standards’ or a moral code because she has never been given or taught any, but it’s also the typical American girl’s expression of uninhibited independence, the spirit of Huck Finn, arising from a dangerously permissive upbringing as James saw it of the newly rising, over-indulged generations. When snubbed by Mrs Walker Daisy can’t understand why she should behave differently in Rome from how she was accustomed to in New York; ‘I don’t see why I should change my habits for them’, she cries when Winterbourne remonstrates with her about her display in the Pincio, and how it offends ‘the custom of the place’. They are ‘those of a flirt’, he points out. 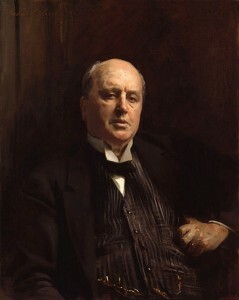 He cannot decide, when she talks so brazenly, whether she is innocently honest or depraved and spoilt; our narrator presents this with repeated, self-cancelling negativity once again – she lacks ‘indispensable delicacy’, she’s ‘childish’, ‘too provincial’, has ‘an inscrutable combination of audacity and innocence’ or ‘puerility’ – ‘inscrutable’ here signifying his inability to scrutinise with clear perception. These ‘little American flirts were the queerest creatures in the world’, he concludes, his ability to see clouded again. Yet he also wonders whether she has ‘in her elegant and irresponsible little organism a defiant, passionate, perfectly observant consciousness of the impression she produced,’ and whether her ‘defiance came from the consciousness of innocence’ or from her sense of belonging to ‘the reckless class.’ Too late he begins to realise hers is a rebellion against class prejudice, and we realise this is not just another ‘international’ James tale of the familiar collision of naive American democracy with corrupt European decadence. It’s more nuanced than that. Winterbourne’s eyes are unsealed too late. Her demise, dying of the ‘Roman fever’ – malaria – by exposing herself to the miasma of the evening air in the Colosseum in one of her flightily dangerous romantic excursions, would be seen by society as just desserts. He has not treated her judiciously, he finally discerns. He’s chastened when the Italian dandy, at Daisy’s graveside, pronounces her truly ‘innocent’ – he ultimately knew she had no intention of marrying him. Sadly Winterbourne tells his aunt that he had done Daisy an injustice. From her deathbed she had sent him a message saying that she ‘would have appreciated [his] esteem’. But he was ‘booked to make a mistake’, as his aunt had warned him. But not in the way she meant: ‘I have lived too long in foreign parts,’ he adds, acknowledging perhaps that it was he who had been tainted by class and European notions of propriety, and had failed to appreciate Daisy for the free spirit she was. When the narrator concludes by telling us drily that he had returned to Geneva and to was ‘studying hard’ and ‘was very much interested in a clever foreign lady’, the ambiguity is poignant. Has he learnt a lesson, or has he simply reverted to ‘the custom of the country’? Is he sadder and wiser? Or counting himself lucky at a narrow escape from commitment to Daisy’s recklessly independent individuality? The conflicted responses of his protagonist here raise this story above the apparent ‘flatness’ that caused James to add the phrase ‘a study’ to this story that was immensely popular with a reading public which perhaps relished the superficial charms of Miss Daisy more than it divined the darker impulses in her ambivalent, superficially more cultivated admirer. Henry James, ‘Daisy Miller: A Study’. From Collected Stories, vol. 1 (1866-91), selected and edited by John Bayley, Everyman’s Library, Alfred A. Knopf (New York, Toronto) no. 244, 1999, pp. 305-64. First published in Cornhill magazine, London, 1878.